This vintage Fred Bear Takedown is a unique piece from the early 70s. 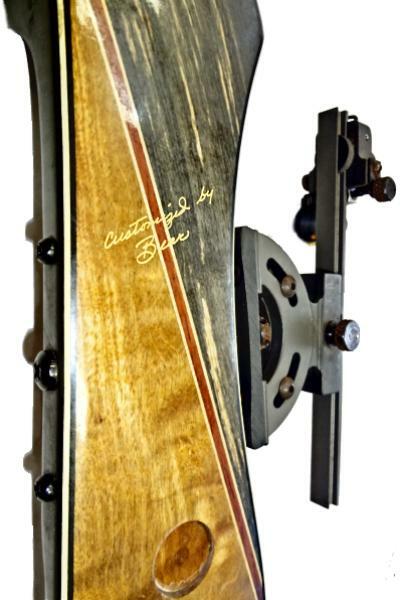 At the heart of the bow is a Model C, Type-II Tournament riser which was factory customized for a low-wrist grip, rather than the standard mid wrist grips found on Bear's products at the time. Combined with a pair of white #3 Limbs, it becomes a 70" target bow with a 33# draw. The bow also includes the a mounted sight and the Bear Omni-Coupler Bow Stabilizer. A brand new Flemish twist Dacron string has been applied to the bow as well. 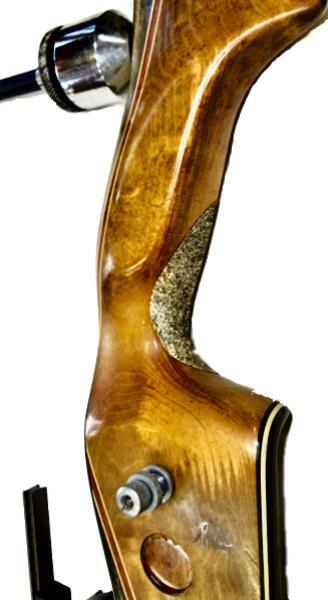 This makes for a smooth and stable shooting experience, thanks to the long limbs and high overall mass. While the finish is overall in good condition, a few adhesive additions have permanently bonded to the finish, as shown in the photos. The original medallion has unfortunately fallen from its socket. Aside from the cosmetic wear, the limbs are in good condition and show no stress in the glass or finish checking. They are also free of any troublesome twisting that can often plague recurves of this vintage.